Hope Burger Bar in Greensboro serves certified Angus Beef that’s hand-pressed and grilled to perfection. What makes this place unique is how well it caters to people’s varying preferences on their burgers. Guests can have the bun of their choice, cooked to their specific requests at the temperature of their liking. They even have vegan and gluten-free substitutes. Even the sides that come with the burgers can be customized to suit the diner’s taste. The burgers and sandwiches come with their choice of chips, fries, veggies, or salad, completing the experience. This casual burger joint uses only the freshest local ingredients. Guests can also top off their meal with the bar’s craft brews. Together with the establishment’s great staff service, Hops is no doubt one of North Carolina’s best spots to grab a burger and a beer. Unfortunately, Hops Burger doesn’t take reservations. This is due to limited seating capacity. Furthermore, they require parties to be present at the time that they are to be seated. 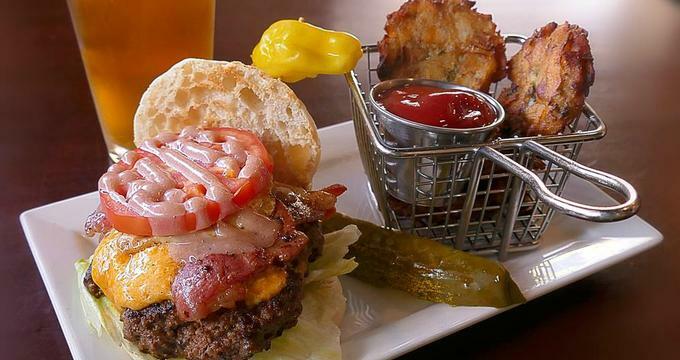 Hops offers a wide selection of burgers created from fresh local produce. The burgers come in 6 oz., 8 oz., or 12 oz. There is also a create-your-own option. In addition, there is also a wide selection of starters, fries, salads, and sandwiches. · The burgers can also come in a variety of buns that guests can choose from. Guests shouldn’t forget to ask for the dessert of the day. Guests can also purchase gift cards at either of the two locations. Those who order from out of town can do so online. For more information about Hops Burger Bar, reservations, and their menu, contact 336-663-0537 or visit their official website.